The software behind the film "Minority Report" -- where Tom Cruise speeds through video on a large screen using only hand gestures -- is making its way into the real world. The interface developed by scientist John Underkoffler has been commercialized by the Los Angeles firm Oblong Industries as a way to sift through massive amounts of video and other data. And yes, the software can be used by law enforcement and intelligence services. But no, it is not the "pre-crime" detection program illustrated in the 2002 Steven Spielberg sci-fi film. Kwin Kramer, chief executive of Oblong, said the software can help in searching through "big data" for information. It can also create souped-up video-conference capabilities where participants share data from multiple devices like smartphones and tablets, integrated into a large video display. "We think the future of computing is multiuser, multiscreen, multidevice," Kramer told AFP. "This system helps with big workflow problems." A key part of the system is the gesture interface, which the company calls the "g-speak" spatial operating environment. That grew out of a project by Underkoffler -- then a scientist at the prestigious Massachusetts Institute of Technology -- for "Minority Report," before he became chief scientist at startup Oblong. "We have demo versions of this kind of software which show exactly the 'Minority Report' user experience, allowing you to move back and forth in time, or to zoom in to look at details," Kramer said. He said the same software can help businesses to "allow better collaboration, visualization and analysis of large amounts of data. "You can have a lot of data but it's hard to make use of that," Kramer said. "It can be on different machines and hard to access. This allows multiple people to look at that." 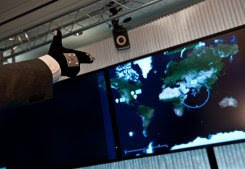 An employee demonstrates the use of a data glove to navigate a map on a computer screen at Los Angeles-based software company Oblong Industries' offices in Washington in June 2012. 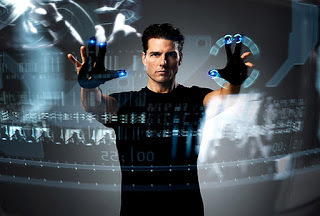 The software behind the film "Minority Report" -- where Tom Cruise speeds through video on a large screen using only hand gestures -- is making its way into the real world. Gestural interfaces have been developed for other firms including Microsoft's Kinect but Oblong says it has far more sophisticated systems which can use Kinect and more. Some highly sensitive systems use a data glove which can be more precise than ordinary hand movements. Oblong has contracts with firms such as Boeing, General Electric and Saudi Aramco to help in analyzing large amounts of data. It is also developing a gestural interface for onboard computers with automaker Audi. It has raised an unspecified amount of venture capital from investors including Foundry Group, Energy Technology Ventures and Morgan Stanley Alternative Investment Partners. Brad Feld, managing director at Foundry Group, said Oblong offers "a path to fundamentally change the way we interact with computers." Yet the question Oblong often gets is how users can get the "Minority Report" software. David Schwartz, the company's vice president for sales, said "We get calls from people in the military who say, 'I want the 'Minority Report' interface." He said the systems could be used for a realistic version of high-tech software interfaces on TV shows like "CSI." "They would like to get it for free," he added. What makes the real-life version of the software different from the one seen on film is that Oblong does not supply the analytics of the futuristic "pre-crime" division. That does not prevent a company or law enforcement agency from using the software and adding its own analytics. "We think law enforcement and intelligence are big data users and we think our technology is the leader," Kramer said. He said Oblong currently has no government customers in the United States or abroad but offers itself as "a core technology provider." Still, Oblong leverages its role in the movies to get in the door, even if the software is not quite the same. "I think most people look at those 'Minority Report' interfaces and imagine how they could use that flexible system in their own office or designs studio," Kramer said. "It isn't science fiction, it's real."